I am sure many of you will remember the Saturday morning Children’s Cinema Clubs; it was almost a must do thing for us teenagers and for many, it was probably the first chance of freedom, where we could do something away from our parents; catch the bus into town by ourselves, go to the cinema and then a quick tour of the shops before we went home. I was a regular at the Gaumont in Wolverhampton. A magnificent 2000 seater cinema/theatre built in 1932 in the grand and glorious Art Nouveau style. The children’s cinema clubs were run by the cinema management plus a selected group of children called the Children’s Cinema Club Committee. On Saturday mornings we wore arm bands with CCC Committee printed on them and acted as ‘monitors’ or ‘prefects’ supposedly keeping the rest of the kids in order. We also met up one evening a week at the cinema to do promotional work like sending out birthday cards to the members. We’d get the work done as quickly as possible and then sneak into the back of the cinema proper to watch every film we could. And, even then, flirt with the younger usherettes! I eventually became Chairman of this committee and one day the manager asked if I would like to earn a little pocket money by working as a tea boy and call boy back stage, as they were about to embark upon the staging of a number of live shows featuring both British and American rock and roll stars of the time. At the time, I think the pocket money meant more to me than the rock and roll stars but the idea of ‘working’ and out late at night was a big attraction. Little did I know that I was to be so privileged. Over the years of 1956 to 1959 I was to meet some of the world’s biggest stars and in many cases fetch their tea, sandwiches, beer and utter those immortal words: “Ten Minutes Mr Holly!”, “Five minutes Mr Haley !”, “On Stage please Mr Orbison!”. Wow, I was up there with the best of them. Buddy Holly and the Crickets, Bill Haley and the Comets, Roy Orbison, The Big Bopper, Chuck Berry, Little Richard, Bo Diddly, The Drifters, The Platters, Duane Eddy; they were just some of the big American stars that I fetched refreshments for and watched in awe from the wings of the stage. There were probably many more that memory, if not time, has forgotten and I can’t for the life of me remember who it was that tried to teach me, without much success, to ride a unicycle across the stage. I almost ended up in the band pit – good job it was before the audience came in. But it wasn’t just the Americans that stole the show. There was a concert about every 6 to 8 weeks during 1956 and 1957 and The Gaumont played host to many of the up and coming British pop stars and established acts of the day. Regular comperes, if I remember correctly, were Pete Murray and Des O’Connor and among the stars that stood out were Billy Fury, Marti Wild (and the Wildcats), Adam Faith, Joe Brown, Gene Vincent, Susan Maughan, Helen Shapiro and the fabulous Lonnie Donegan. In those days, no show would have been complete without the incomparable Beverley Sisters. They were cute, they were sassy and I was mesmerised, particularly with the twins, Teddie and Babs. Yes, I was already a great admirer of the female form and I don’t think it’s ever left me! They were so good to me for ‘looking after’ them and at the end of the week gave me a big box of chocolates and a £5 tip. That was a lot of money in those days. But I had performed one big extra duty for them. (No nothing like that – I was only 13). 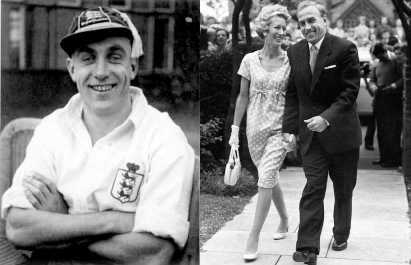 Joy, the elder sister had brought her son Vincent with her and he was a very big fan of Wolverhampton Wanderers and particularly the captain, Billy Wright. Joy asked me if I thought there was any way Vincent could get to meet him and go to Molineux football ground. It just so happened that a only a month or so earlier that I had met Billy Wright and the then manager, Stan Cullis when I had cajoled one of the reporters on the Express and Star to take me with him to the press box on a Saturday afternoon. In those days the press were invited to go into the Board Room after the match to have a cup of tea. I was introduced as an up and coming reporter. So, of course, I said to Joy that I could arrange it! Being the ‘grown up’ as I was, I telephoned the office at Molineux, saying that I was from the Express and Star and that I was with Joy Beverley of the Beverley Sisters and could they possibly come to the stadium to meet Billy Wright. I’m sure they didn’t agree because it was me phoning, but agree they did and the next day Joy, Teddie, Babs and Vincent went off to the ground. Joy fell in love with Billy Wright and the rest, they say, is history. They married in 1958 and were married for 36 years until Billy died of cancer in 1994. I would like to feel that I played a big part in their meeting. Although when Michael Aspell opened that big red book for Billy Wright’s “This Is Your Life” in January 1990, I was very disappointed that I hadn’t been called onto the programme as the person who had helped to bring Billy and Joy together! Life on the celebrity front was quiet for the next two or three years whilst I concentrated on finishing school and passing exams, before going out into the big wide world. However, there is one occasion which is worthy of note. The big television show that we teenagers had to watch was “Thank Your Lucky Stars” which was recorded at an old cinema, turned TV studio just outside Birmingham, by ATV. Its presenter was Brian Mathews and apart from the live bands and singers, it featured a slot where panellists would discuss and vote on five newly released records. The usual panel consisted of two or three celebrities and two teenagers picked from the audience. I and a bunch of my friends went to the recording and, guess what? I was picked as one of the panellists along with a girl called Janice Nicholls. I remember that Pete Murray and Lulu were two of the celebrities. I forget who was the third. Janice was a very attractive girl but she had the strongest Midland’s accent and became famous for giving each record five points, with the statement, “O’ill geeev it foive.” The audience and obviously the producers loved it, and she went on to become the resident audience panellist and her one-liner became a national ‘catchphrase’. I didn’t do so bad either! After the programme I chatted up Janice and she agreed to let me take her home. We then “went out“ together for four whole weeks.! To use an expression of that time, I then “chucked” her because she lived too far from me and not having a car in those days, I had to catch the last bus home from Walsall to Wolverhampton which then meant I had missed my last bus from Wolverhampton to Tettenhall Wood, where I lived so I had to walk the last three miles. I wasn’t going to keep that up for a snog and a quick fumble! I started work as a reporter on a weekly newspaper in Sheerness on the Isle of Sheppey, in Kent. It was as far away from celebrities and show business as you could get and so the glamorous side to my life faded, but only for a while. Look out for the next part of my story – “ The In-Between Years” coming very soon. With thanks to all the celebrities and personalities for their pure existence, without whom this book would not have been possible. And with special thanks to all of those who took the time and trouble to act as ordinary people, happy to meet with ‘their public’ and discuss the facts of everyday life. This entry was posted in Peter Wills and tagged Adam Faith, Beverley Sisters., Billy Fury, Billy Wright, Bo Diddly, Chuck Berry, Little Richard, Name Dropper, Rock and Roll, Roy Orbison, The Drifters, The Platters, UK, USA. Bookmark the permalink. Over 100 films from around the world have now been submitted for showing or competition at the Golden Island International Film Festival which takes place in locations around North Cyprus, from November 7th to 13th this year. A first for North Cyprus, the festival which is sponsored by Creditwest Bank and Girne American University, is now beginning film reels are rollingto take shape and there will be a host of events including Gala Evenings, Film Showings and much more at venues in Kyrenia, Lapta, Nicosia, Famagusta and the ‘Buffer Zone’. Full details of the festival programme and locations will be announced a little later.